This Sunday, DAC’s own Carolina Del Toro has curated a new show of work around “the Day of the Dead” for the Dia De Los Metros festival at the Downey Theatre. Come upstairs and enjoy the art exhibit in the lobby of the theatre. 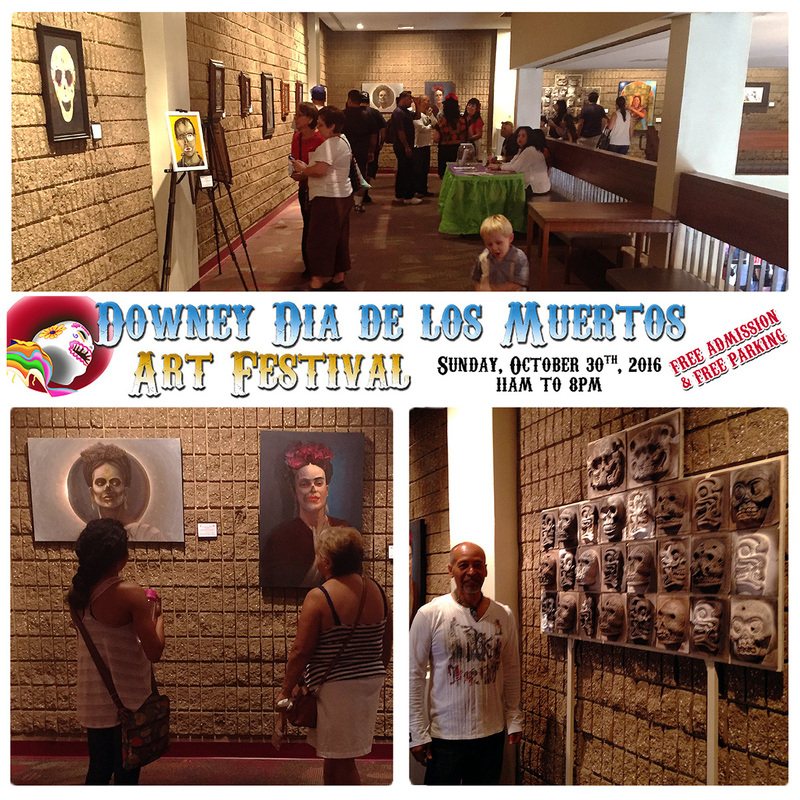 Approximately 15,000 festival goers will enjoy a full day of free family entertainment at the 4th annual Downey Dia de Los Muertos Art Festival, to be held Sunday, Oct. 30th, 2016, from ll:00 AM – 8 PM at the Downey Theatre and Civic Center, 8435 Firestone Blvd. Rated as one of the best events in Downey, the Festival opens with a welcome by City civic leaders, immediately followed by a performance of Aztec dancers that weave throughout the venue. The entertainment lineup includes film, ballet folklorico, music (romantica, mariachi, cumbia, latin jazz, mambo and much more), urban art, fine art, “make and take” calaveras (sugar skulls) and papel picado (tissue paper cut outs), costume contest, face painting, plus food trucks, shopping, altar displays and more. Dia de Los Muertos, literally “Day of the Dead,” is an annual Mexican tradition that honors and celebrates deceased family and friends. A combination of Aztec and Catholic customs, Dia de los Muertos is both festive and solemn. Common symbols of this tradition are skeletons in outlandish dress and decorated sugar skulls. In cemeteries and in private homes, altars/ofrendas are created for the deceased: photos, favorite foods, pictures of things they liked to do, candles, marigolds. Also new this year is the “Community Stage,” the Festivals third entertainment location. The intimate Zocalo Stage, with its live music, the 738 seat “Theatre Stage” hosts continuous, professional ballet folklorico performances from 11am to 8. Film screenings include the traditional noon showing of “Macario”, an Acadamy Award nominee for best foreign film from the “Golden Age” of Mexican cinema, “Macario” is the quintessential example of magical realism with cinematography by the world famous Gabriel Figueroa. Also showing is “Book of Life” the 2014 imaginative animated and charming Day of the Dead modern day fable. It received a Golden Globe nomination for Best Animated Feature Film. Also in the Theatre, in the main lobby, are displays of decorative altars, made by ASPIRE students. ASPIRE is an afterschool enrichment program funded by a state grant. administered by The City of Downey and Downey Unified School District. The balcony lobby’s fine art exhbit includes painting, collage, and mixed media coordinated by Carolina Del Toro of the Downey Arts Coalition. A new sculpture by Martin Sanchez, created specifically for Downey, and a parade of 10 catrinas, six foot tall gaily dressed paper mache skeletons, are the highlights of “Urban Art Alley.” The popular “trunk altars” are returning. For the 4th year, Aurora Chavez, a papel picado master artisan, who studied with the famed L.A. native and grande dame of Mexican folk art, Olga Furginson, will demonstrate traditional, hand cut tissue paper; nearby sisters Helen Nieto, Barbara Valenzuela-Almaraz and Frances Valenzuela will oversee the calaveras decorations . These women worked closely with Angela Villalba, the doyenne of the American calaveras industry. Grounds entertainment include face painters, a community mural, balloon artist, and other surprises. Food trucks offer a wide variety of cuisine, from Argentinian to Mexican to American waffles and pizza with nearby tables with umbrellas for picnicking. There’s a shopping corridor with over 30 vendors selling Dia de Los Muertos themed merchandise, and a “commercial zone” with a dozen small, local businesses presenting their wares. Local sponsors include Amapola Markets, AppleCare Medical Group, Avenue Press, Downey Federal Credit Union, Downey Nissan, and Rose Hills Memorial Park & Mortuaries. The Festival is a presentation of the City of Downey and the Downey Theatre.